Caption: A mix of cells collected from an abdominal cancer. 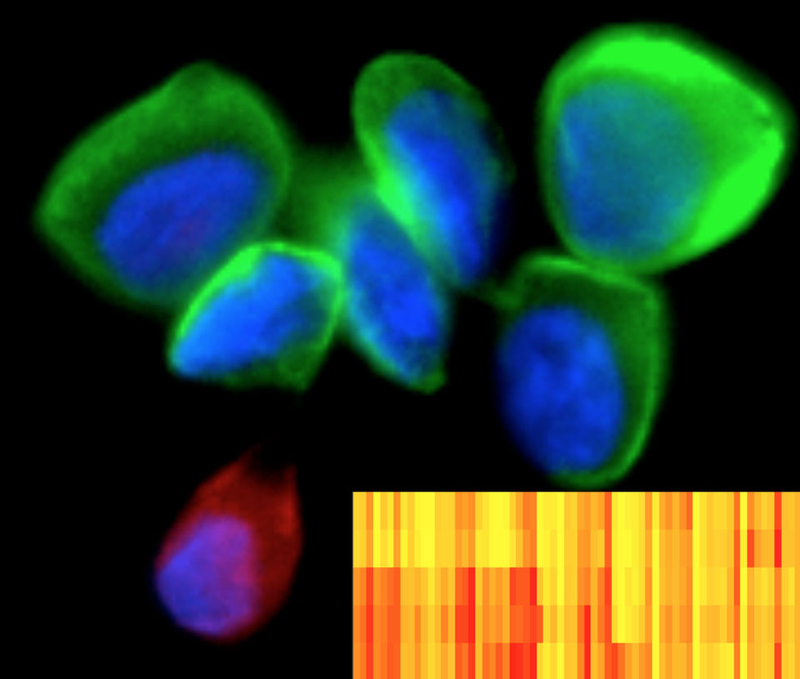 The cancer cells (green) are positive for a cell surface cancer marker called EpCAM. The red cell is a normal mesothelial cell. The nuclei of all the cells are stained blue. Each of the five rows in the red, orange, and yellow “heat map” in the corner represents one cell, and the intensity of the color in each of the ~30 narrow columns reflects the abundance of a particular protein. It is apparent that there is a lot of heterogeneity in this collection of cancer cells. The proteins speckling the surface of a cancer cell reveal critical clues—the type of cancer cell and a menu of possible mutations that may have triggered the malignancy. Since these proteins are exposed on the outside of the cell, they are also ideal targets for so-called precision cancer therapies (especially monoclonal antibodies), optimized for the particular individual. But in the past, to analyze and identify these different proteins, large samples of tissue have been needed. Typically, these are derived from surgical biopsies. But biopsies are expensive and invasive. Furthermore, they aren’t a practical option if you want to monitor the effects of a drug in a patient closely over time. Using a minimally invasive method of cell sampling called fine needle aspiration, physicians can collect miniscule cell samples frequently, cheaply, and safely. But, until now, these tiny samples only provided enough material to analyze a handful of cell surface proteins. So, it comes as particularly good news that NIH-funded researchers at Massachusetts General Hospital in Boston have developed a new technology that quickly identifies hundreds of these proteins simultaneously, using just a few of the patient’s cells . The key to this new method is a clever adaptation of the familiar barcode. The new tool is based on antibody sensing, in which each antibody recognizes a specific protein on the cell’s surface and binds to it. But the researchers needed a highly sensitive method to detect which antibodies had bound to the small number of cells present. So they tethered each antibody to a unique single strand of DNA, 70 letters (A, C, G, or T) long—the barcode—which snaps off when the sample is exposed to ultraviolet light. The barcodes are then collected, labeled with fluorescent molecules, photographed, and analyzed. Each barcode reveals the identity of a protein; the number of each barcode reveals the quantity of each protein on the cell surface. To test the technology, the researchers identified 88 different protein targets on breast cancer cells. They also showed that six samples of lung adenocarcinoma cells that looked identical under the microscope had very different cell surface proteins: suggesting that the six patients required quite different therapies. This technology has applications beyond cancer to any circumstance where cell populations are accessible and changing in response to therapy. (Think autoimmune disorders, for example.) We could collect cell samples from a patient, test a range of drugs, and then examine cell surface proteins—which change with time and drug efficacy—to determine the best therapy. This technology thus represents another promising step toward personalized, or precision, medicine. Cancer cell profiling by barcoding allows multiplexed protein analysis in fine-needle aspirates. Ullal AV, Peterson V, Agasti SS, Tuang S, Juric D, Castro CM, Weissleder R. Sci Transl Med. 2014 Jan 15;6(219):219ra9. Fine needle aspiration for biopsy material needs some good news. Monoclonal antibodies barcode tailored to each unique patient pathology is like bringing Haute Couture medicine to the masses. Congratulations NIH!